Previously released in 1996 with no artist name! Mow with 4 bonus tracks. 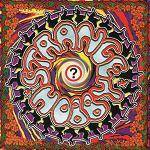 More information: STRANGE HOBBY was previously released in 1996 without saying who the artist was! It can now be announced it was legendary Dutch prog artist ARJEN ANTHONY LUCASSEN! Strange Hobby has been out of print for over a decaseand is now a much sought after collectors’ item. This edition includes FOUR bonus tracks which have not been available on the album previously.